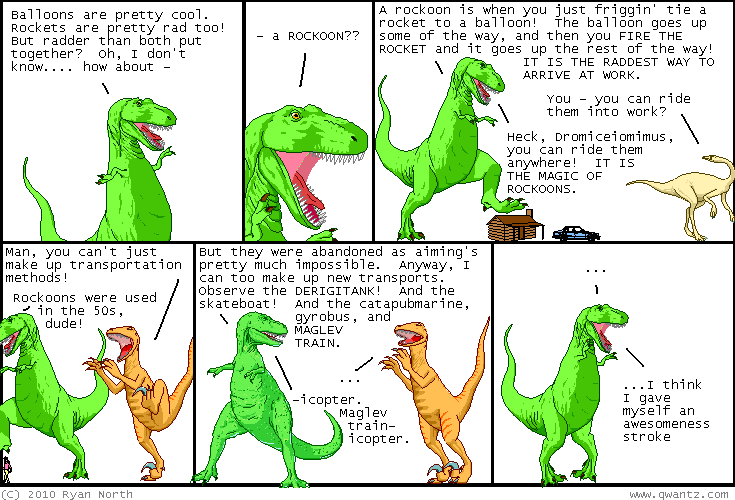 Dinosaur Comics - January 27th, 2010 - awesome fun times! –I believe today I will go down to the beach and swim! Naked! January 27th, 2010: Rockoons! JUST AS AWESOME AS YOU IMAGINED. So yesterday I linked to Posterchild and Jason Eppink's awesome Astoria Scum River Bridge (a story that was picked up by Boing Boing!) and said it was cool how street art can be constructive. Post's latest update is even more awesome: the bridge has been tagged (thereby christening it as an official Brooklyn piece of public transit), but also, NYC Council Member Peter F. Vallone Jr. (representin' Astoria!) sent them an official letter thanking them for making the bridge, and promising that the leak that caused the bridge to be necessary in the first place will be repaired. So awesome, you guys! Often when people online talk about street art, the conversation devolves to "hurr hurr if someone ever tags my suburban garage door I'll kill 'em, nobody better tag my suburban garage door", and it's really cool when something like this happens and you can point to it and say "positive change through street art, JERKS" and then whisper under your breath "sorry for calling you jerks, but seriously".